Leipzig: Frederic Hofmeister, 1848. p. , 32-35, [blank].Disbound, some foxing and offprinting. Duet for two voices (soprano and tenor). No. 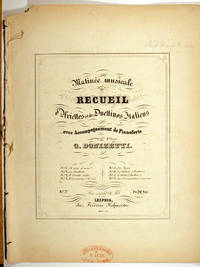 7 from the series of 8 or 10 pieces Matinee Musicale Recueil probably first published by Lucca in Milan in 1842 (Hofmeister-V. 1842, p. 62) then published by Hofmeister in April and June 1848 and January 1850 (Hofmeister-Band 1848, p. 65, 98; 1850, p. 15). Text by E. Deschamps but not indicated in this edition. ''Io resto fra le lagrime abbandonata e sola ne in tanto duol confortami di speme una parole ahi! che di fato orribile presago e il core in me ahi!'' Text in Italian with German translation. With the stamp of the music publisher and retailer Scharfenberg & Luis, New York (per their ad in Dwight's, located at Broadway and Ninth street, ''Importers of Foreign Music'') on the cover.. First Thus. Wraps. Very Good. Folio - 13'' X 10.5''.